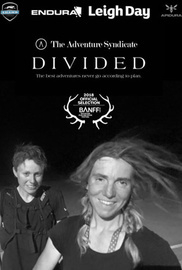 In 2017, Rickie Cotter and Lee Craigie rode the Tour Divide, a 2745 mile self-supported mountain bike race from Canada to the Mexican border. In 2017, Rickie Cotter and Lee Craigie rode the Tour Divide, a 2745 mile self-supported mountain bike race from Canada to the Mexican border. Shot entirely using a Go Pro and an iPhone, this film documents the journey the two friends made in a way The Adventure Syndicate hope inspires and encourages the watcher to get out there and have their own adventure. Fear of failure can stop all sorts of adventures before they even start but what if failing is the best part? Best Adventure Sports Film - Kendal Mountain Festival 2018. Official Selection Festival Gorniskega Filma 2019. Official Selection Banff Film Festival 2018.